Still have a few posts on China to write, even though I’ve been back for over two weeks! Can’t let all of these photos sit on my laptop with nothing to do. My last day in China was a Saturday, which meant that I had time to see more of the sites. My postdoc advisor Taco and his student Yundou and I went first in the morning to see a very historic location: the site of the starting point of the famed Silk Road, now a museum about it. No, not the online black market known as the “Silk Road” that was shut down in 2014. 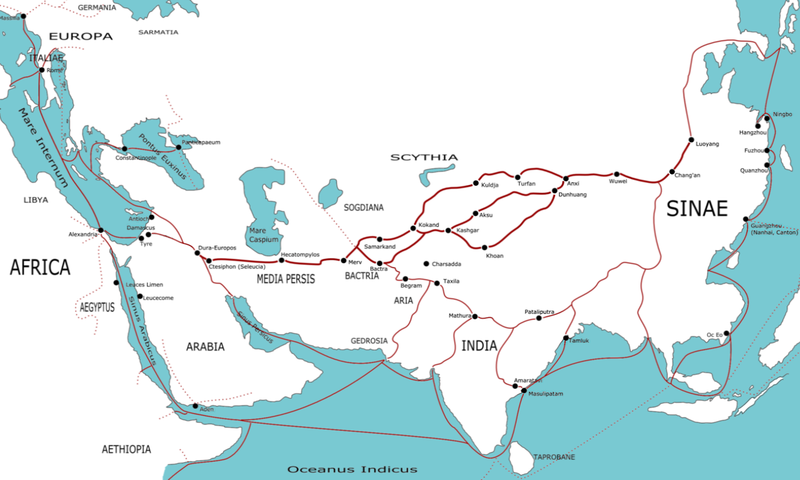 The original Silk Road was an ancient and long-lived trade route that connected the West and East, beginning in 130 BCE and ending in 1453 CE. 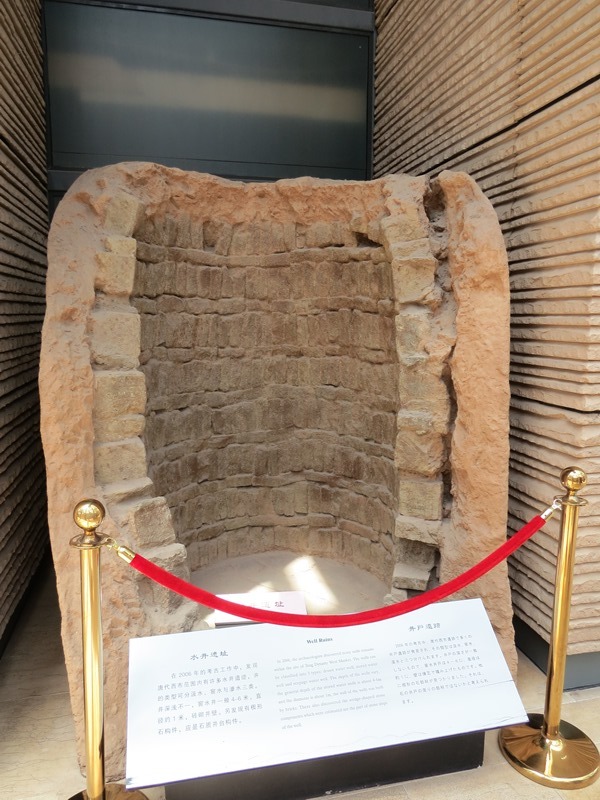 It was opened by Emperor Wu of the Han Dynasty and lasted until the Byzantine Empire fell to the Ottomans, the latter of whom cut off all contact with the West. Trading routes on the Silk Road around roughly 100 CE. 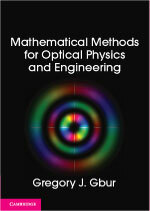 Image by Shizhao, reproduced under the GNU Free Documentation License. So “road” is not quite accurate, but the “silk” part is: the Silk Road got its name for all of the Chinese silk that was in great demand in the West. I would have a chance to see some samples of it during my visit to the museum. The road also brought less welcome goods to the West: the bubonic plague of 542, which is estimated to have killed some 25 million people, likely was brought via the Silk Road. 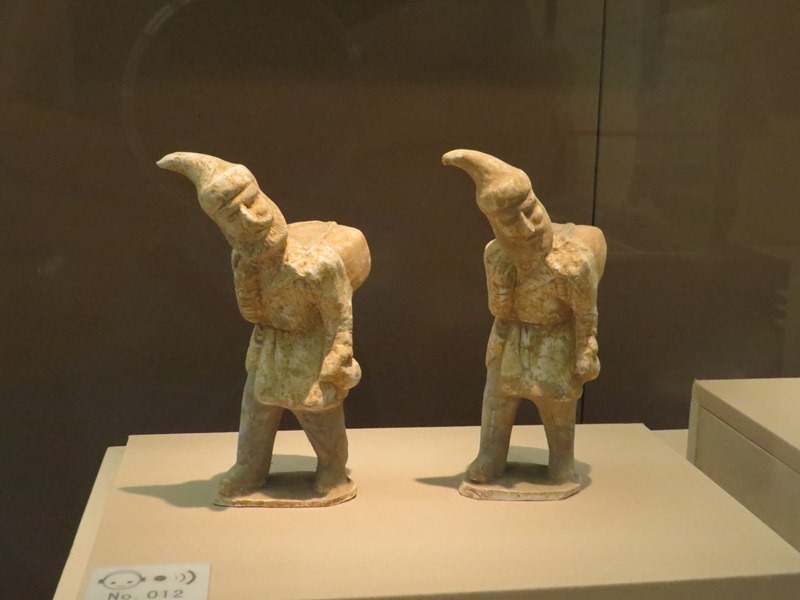 The Silk Road Museum is built on top of the archaeological remains of the Western Market that marks the start of the routes. 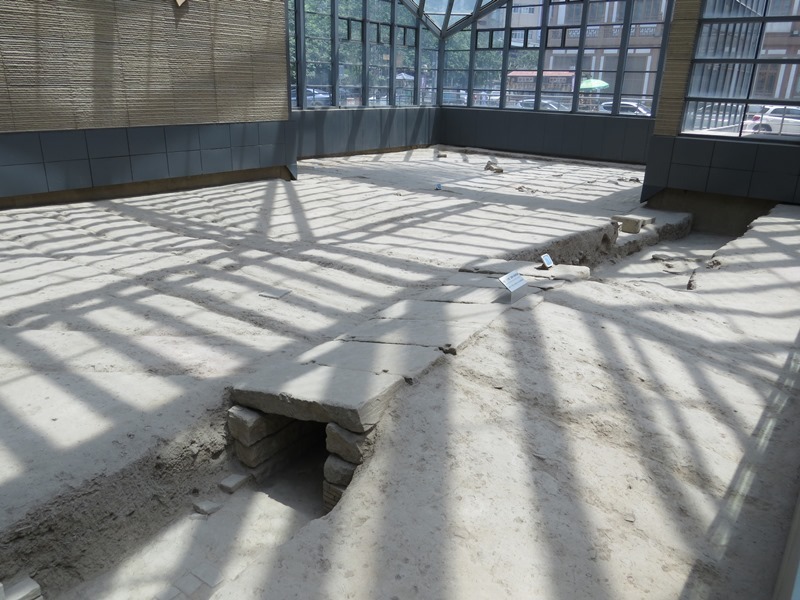 I have not been able to determine exactly when excavations took place, but most signs at the museum indicate that the work was done around 2006. 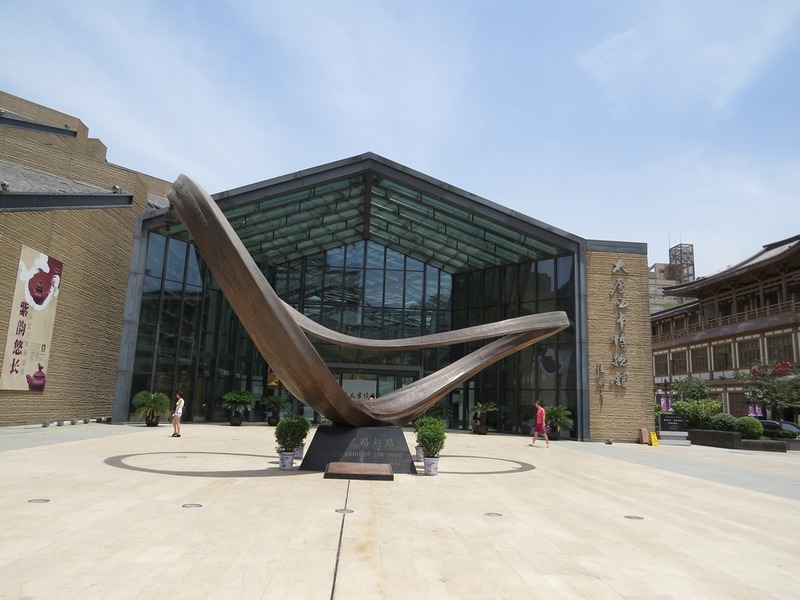 In fact, the museum is part of a large “21st Century Tang West Market” complex, which features the magnificent Tang West Market Hotel. The Tang West Market Hotel. It looks like an incredible hotel, and quite reasonable in U.S. dollars. At the time of this writing, I estimated about $92/night from their website. Around the corner of the hotel to the right is what I’ve been calling the “Silk Road Museum,” though it is properly called the “Tang West Market Museum.” As I understand it, it is a private museum, containing relics excavated from the original West Market as well as many relics from the founder’s private collection. The entrance is certainly impressive. 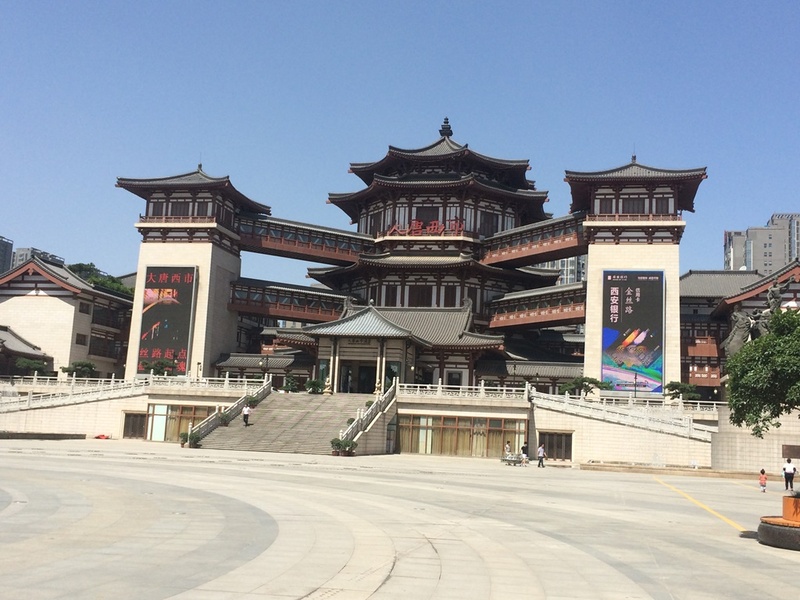 The entrance to the Tang West Market Museum. 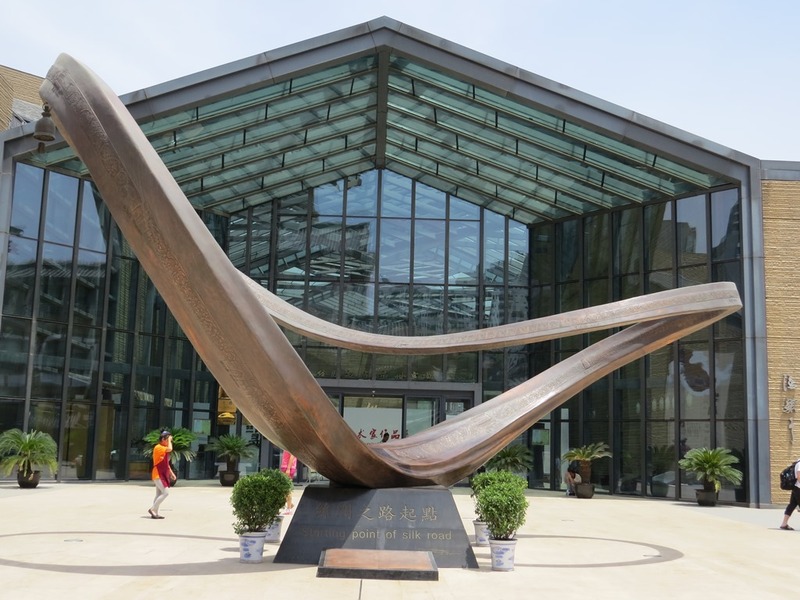 The sculpture in the front of the museum symbolizes the starting point of the Silk Road. Mathematically-minded people may recognize it as a very stylized Möbius Strip! The “starting point” of the Silk Road. 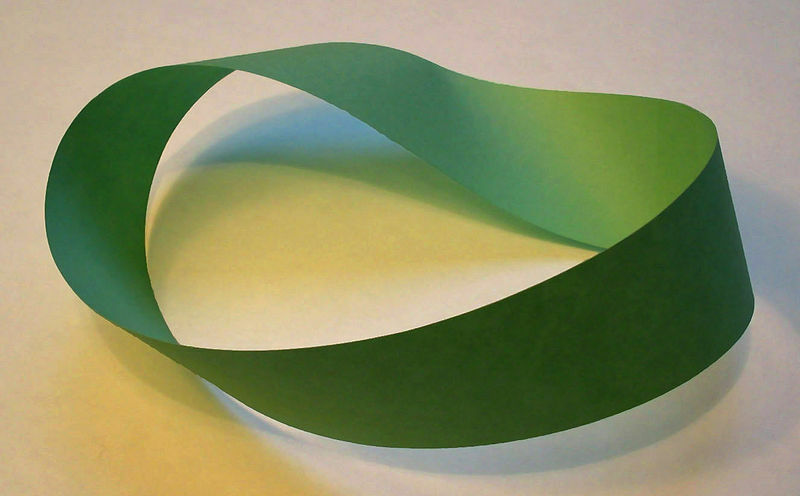 For those unfamiliar, a Möbius strip is a one-sided surface, formed by taking a strip of paper, twisting one end 180 degrees, and then gluing it together. Below is an image of such a strip, via Wikipedia. There is a surprising amount of mathematics and physics that opens up with the study of such structures; I’ve blogged in the past about the relationship between Möbius strips and optics. It seems like an ideal symbol for the ancient trade route, as well — a continuous and unending path. Immediately inside the museum is a large atrium that includes space for temporary exhibits as well as the original archaeological remains of the West Market. The layout is rather neat: the building is built on top of the remains, some of which is under glass beneath your fee and some of which is in open roped-off sections. There isn’t too much to see in the digs, which have probably been thoroughly excavated, but a few small structures remain, such as the small stone bridge pictured below. Small pedestrian bridge of the old West Market, passing over a culvert for water. Many wells were also found and excavated at the site, such as the one shown below. An excavated well at the West Market. At this point of the tour, I was wondering whether there was much to photograph at all at the museum! When we moved upstairs into the galleries, however, my worries were put to rest. 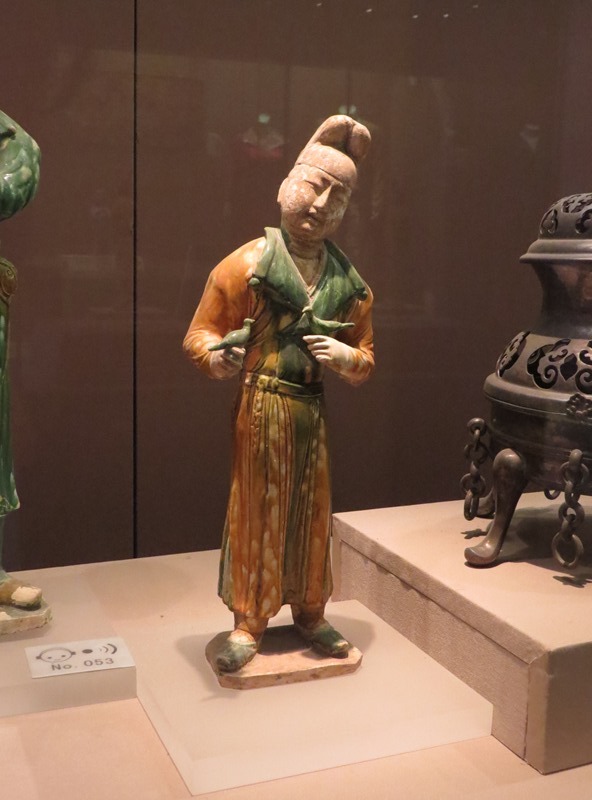 The collection of Tang Dynasty artifacts is really impressive. Some of the artifacts came from the West Market itself, such as the brick below. Brick in the shape of an animal face, excavated in the West Market. 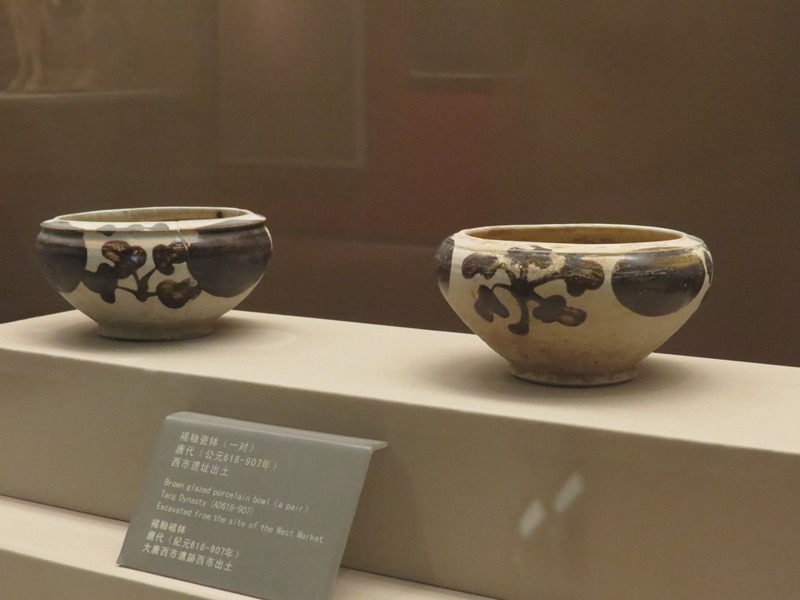 Considering most of the artifacts on display from this point on were labeled at dating from the Tang Dynasty, it might be a good time to say a little about said dynasty. Running from 618-690 CE and then from 705-907 CE, it was one of the longest dynasties and one of the most prosperous in terms of culture and technology, in significant part due to the reopening of the Silk Road in 639 CE. The gap in the dynasty years was due to Empress Wu Zetian of the Zhou Dynasty briefly seizing power. 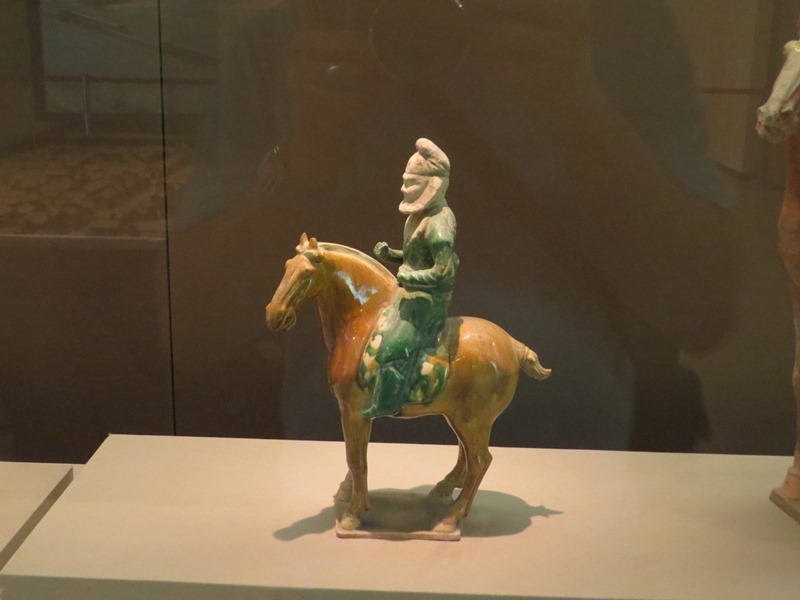 The capital of the Tang Dynasty remained in Xi’an, following the previous dynasty, and the territory of the empire was estimated through several censuses to be on the order of 50 million people. Many famous Chinese painters and poets flourished during the Tang Dynasty, such as the painter Zhang Xuan (713-755), whose painting “Spring Outing of the Tang Court” is reproduced below. 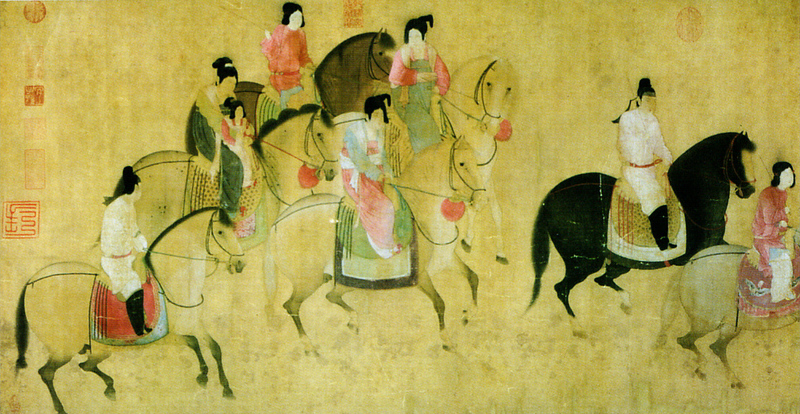 Spring Outing of the Tang Court, by Zhang Xuan. 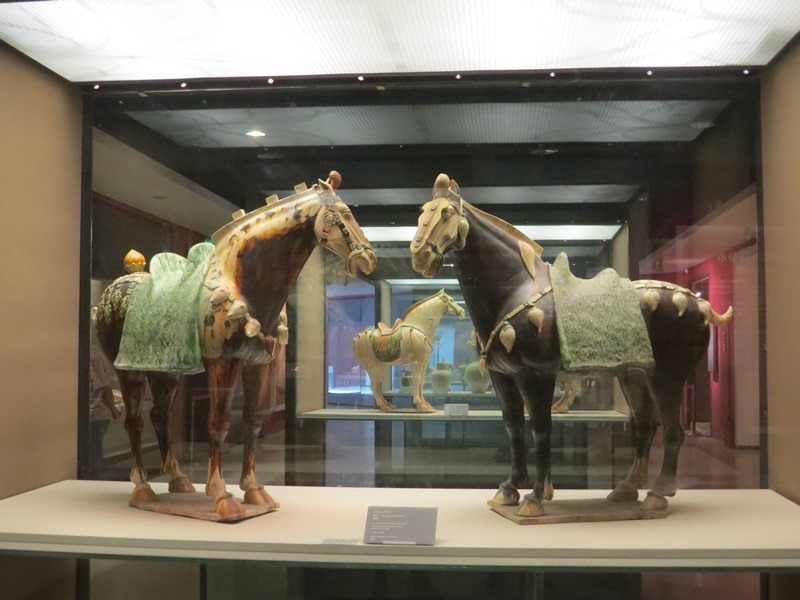 So the Tang Dynasty was a particularly exciting period of growth of Chinese culture, and it shows in many of the lovely artifacts on display in the museum. 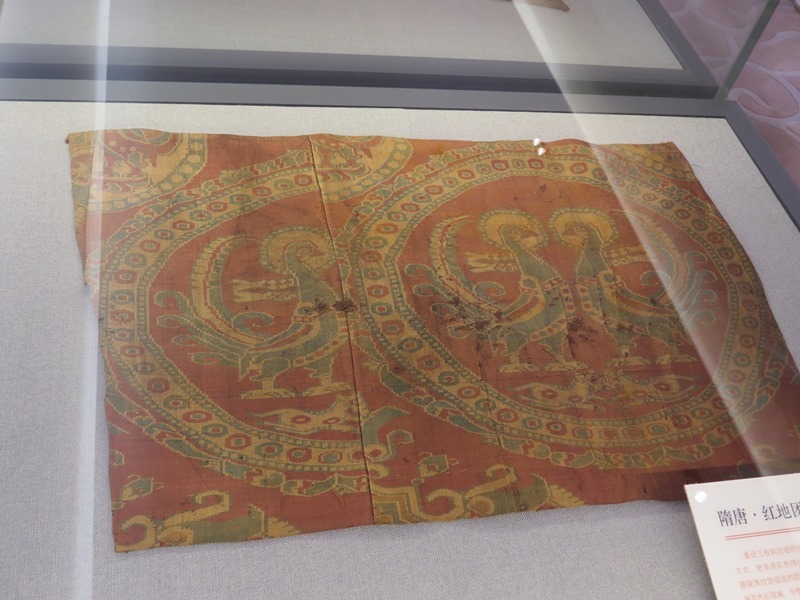 Some of the most fascinating, however, were those crude artifacts that give insight into how business was done in the market. 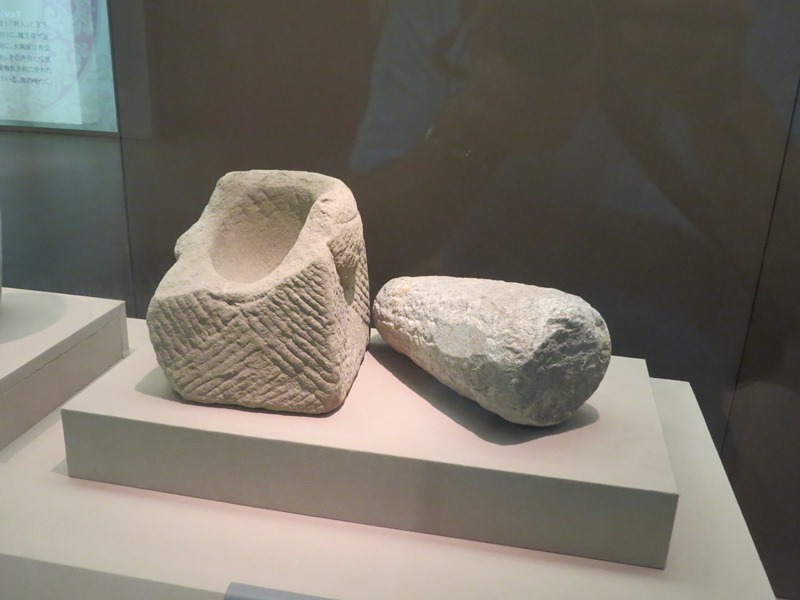 Stone mortar and pestle, excavated at the West Market. As the West Market was a place for international trade, weights, measures, and methods of counting would be extremely important. Stone weight excavated at the West Market. Unsurprisingly, many coins were excavated at the market; the one pictured below was not, and is from a private collection, but is representative of those found. 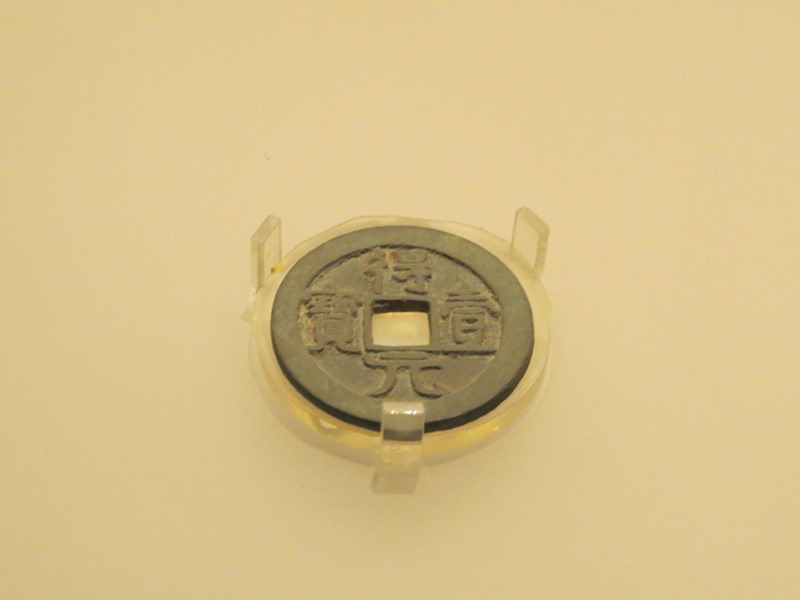 Tang Dynasty “Deyi coin,” according to accompanying label. Looking at all the coins, I wondered why they all have holes in the middle. It suddenly occurred to me that they might have been fashioned this way to allow them to be carried easily and safely on a rope or necklace. I have no idea if this is the case, but it was interesting to ponder. 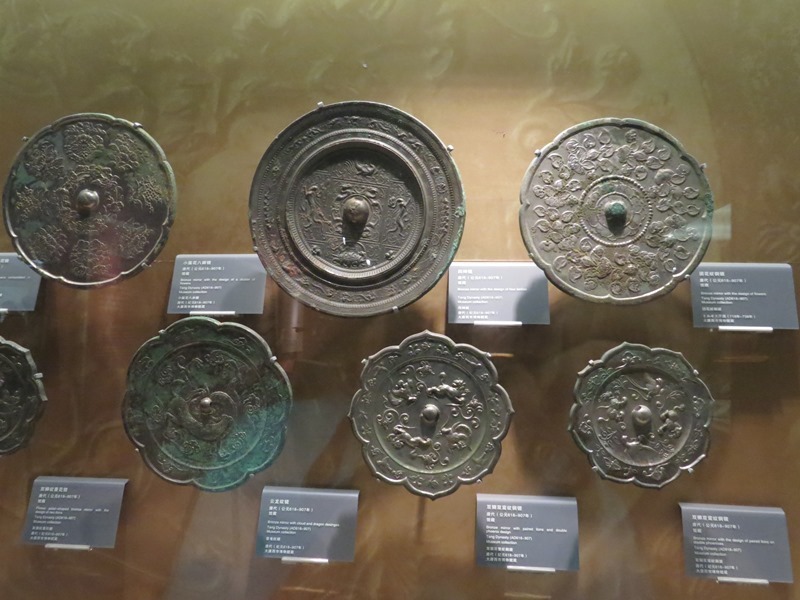 One of my favorite things in the museum was the large collection of exquisite bronze mirrors. Such mirrors were evidently manufactured and sold in great numbers in the West Market, and from their appearance one can see why. Here’s a picture of a number of them together. Obviously, we’re looking at the decorated back faces of the mirrors! Almost all of the mirrors featured animal designs, and some of them included additional inlays. Mirror with inlaid turquoise parrots. 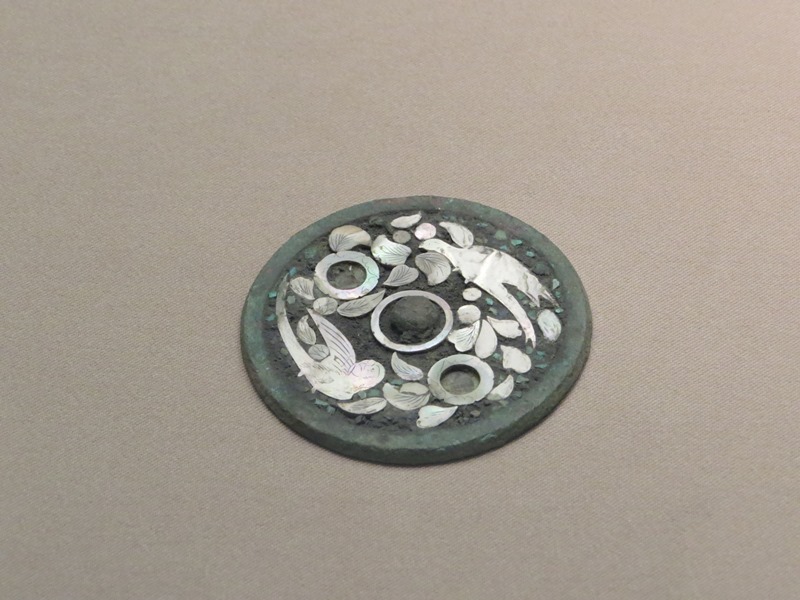 Others simply used the bronze itself to make lovely patterns, such as the following. 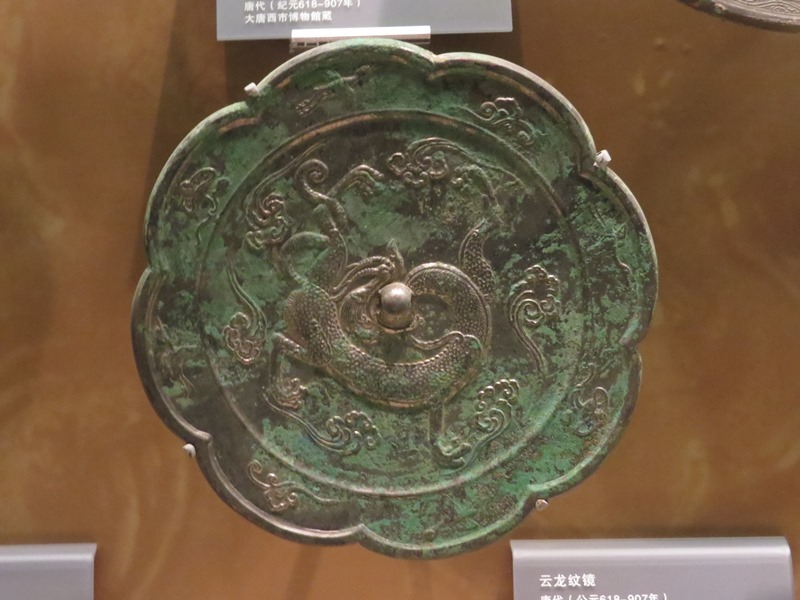 Mirror with dragon and clouds. 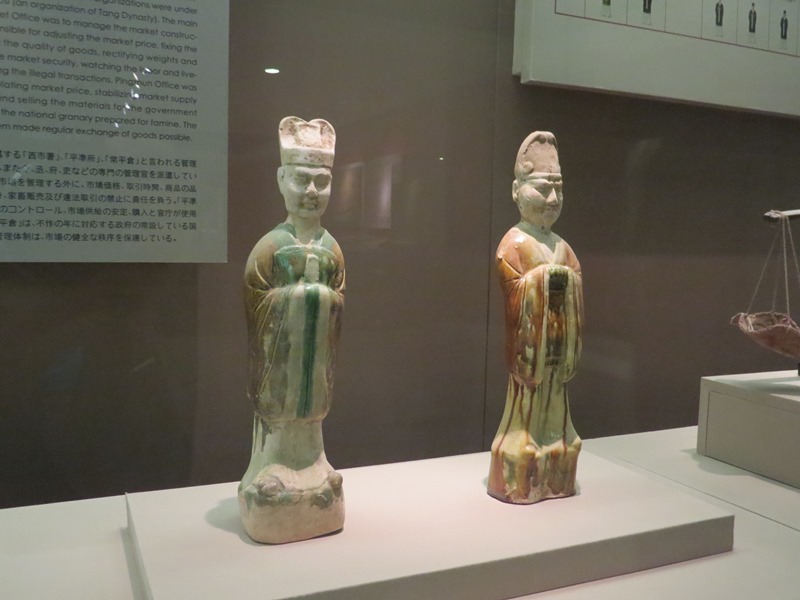 The real stars of the museum though, in my opinion, were the painted figurines. The first pair I encountered weren’t spectacular, but they did remind me of something. The polychrome effect was obtained by using as coloring agents copper (which turns green), iron (which turns brownish yellow), and less often manganese and cobalt (which turns blue). 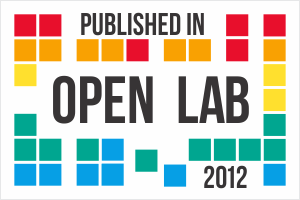 I didn’t see the blue very often; it seems that the “three colors” could vary from place to place. In most figures I saw, the colors were brown, green and tan/white. A pair of non-barbarians are shown below, also in the tri-color style. 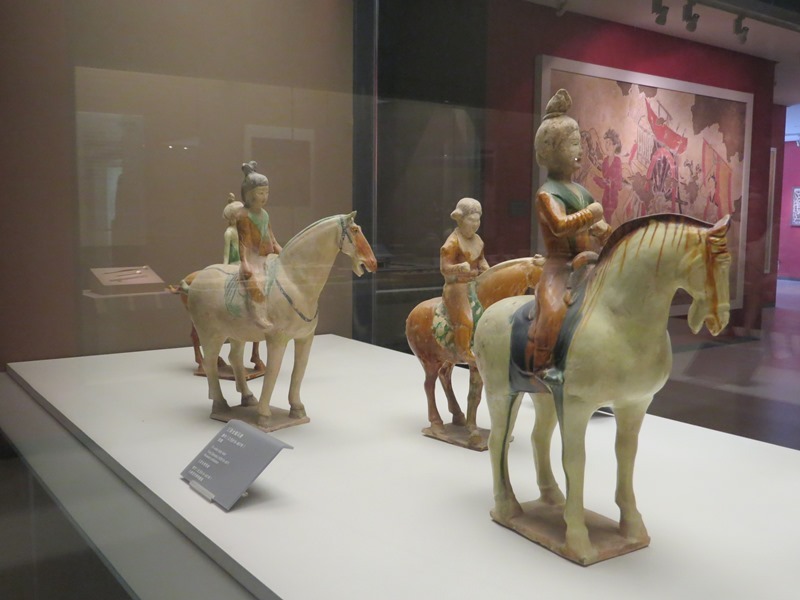 The most famous and memorable of the tri-color figures, however, are the horses. 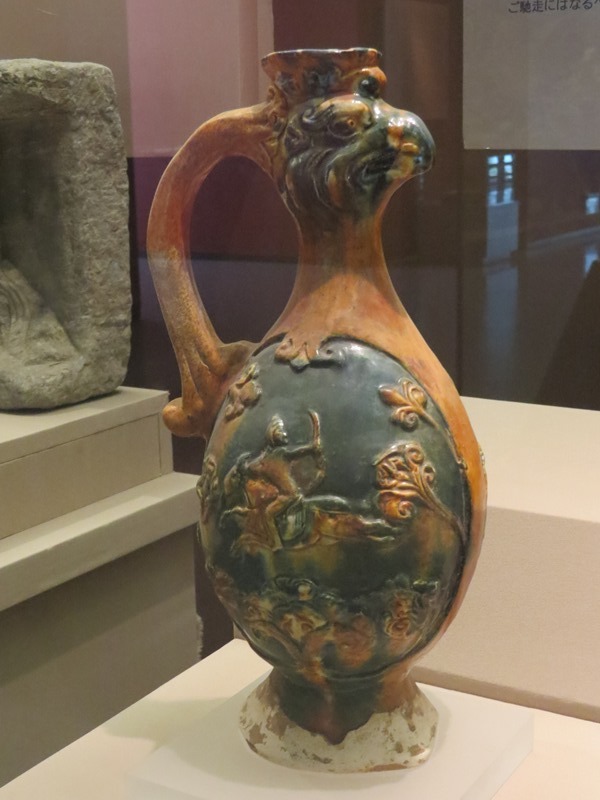 The Silk Road Museum had a number of lovely examples. 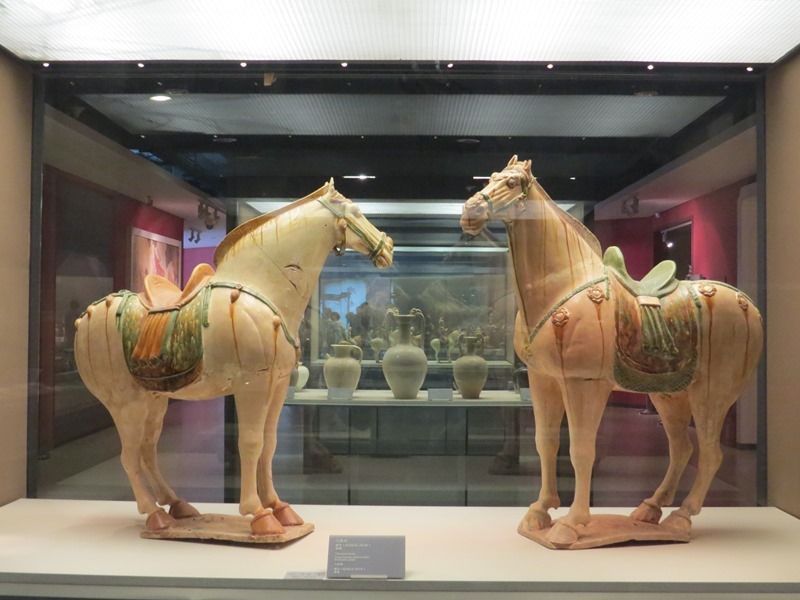 Pair of tri-color pottery horses. Three colors may not seem like a lot of color to work with, but it allowed a surprising amount of variety, as the next pair of horses shows. Second pair of tri-color horses. The pottery could, of course, be much more practical, as the following pair of bowls indicates. 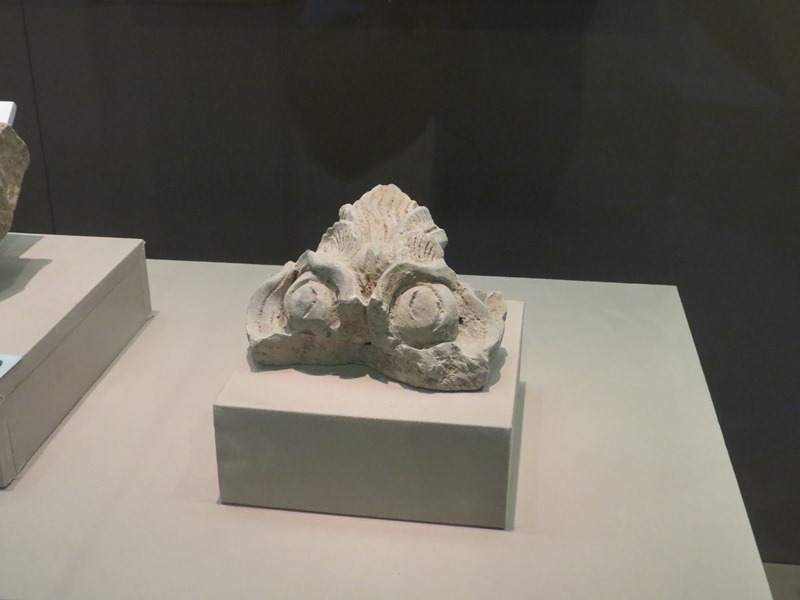 Pair of porcelain bowls, actually excavated at the West Market. 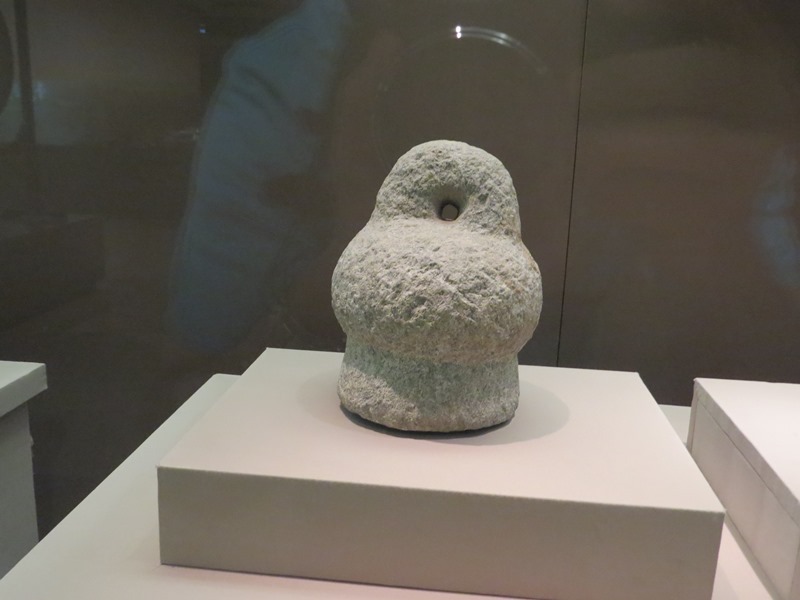 At least one item on display in the museum, however, was of… uhhhh… unclear purpose. 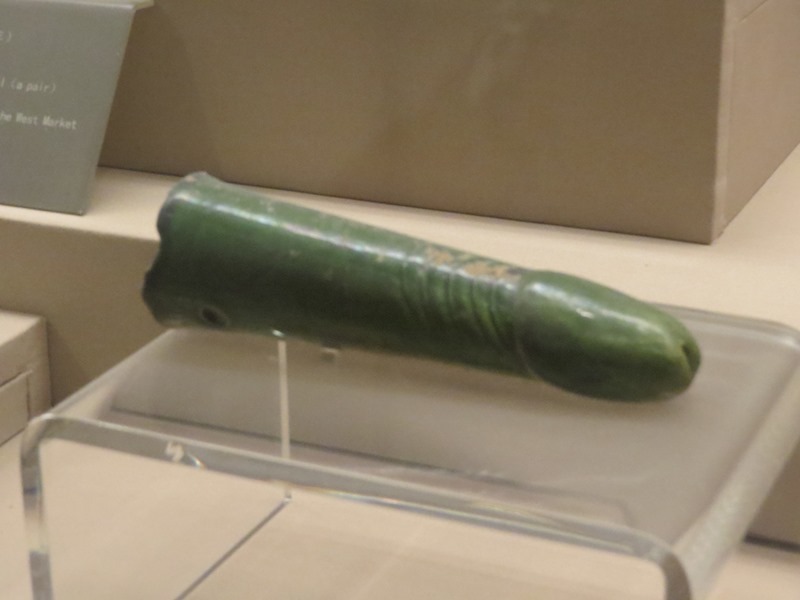 No, according to the sign it’s a “green glazed pottery ornament.” You pervert. Even functional pottery could be really beautiful, as the following tri-colored pot illustrates. I could go on for quite a while about tri-color pottery, but let me show just a few more examples. The lady riders below were quite lovely. 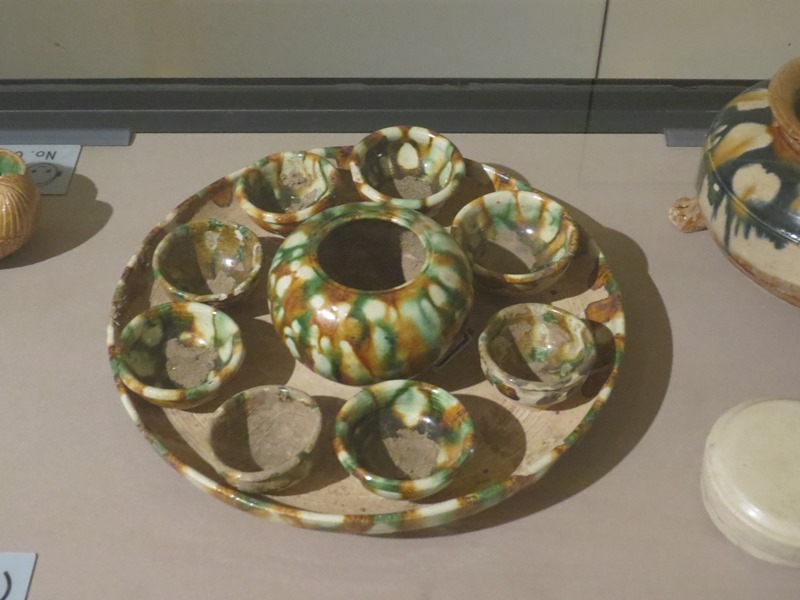 Some of the pieces could very well be contemporary housewares but, remember, all of these are dated to the Tang Dynasty. 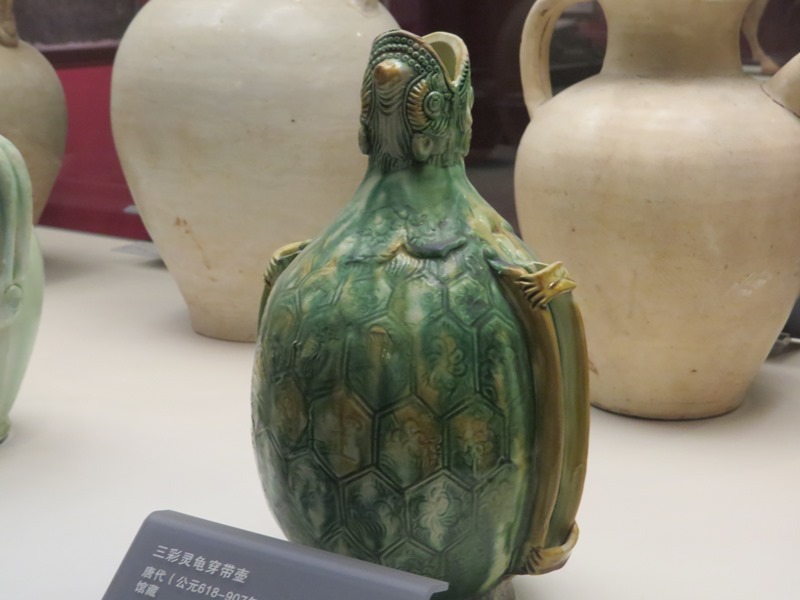 Tri-color wine container in the shape of a Mandarin duck. Now we get to some of my favorite figurines — the scary ones! 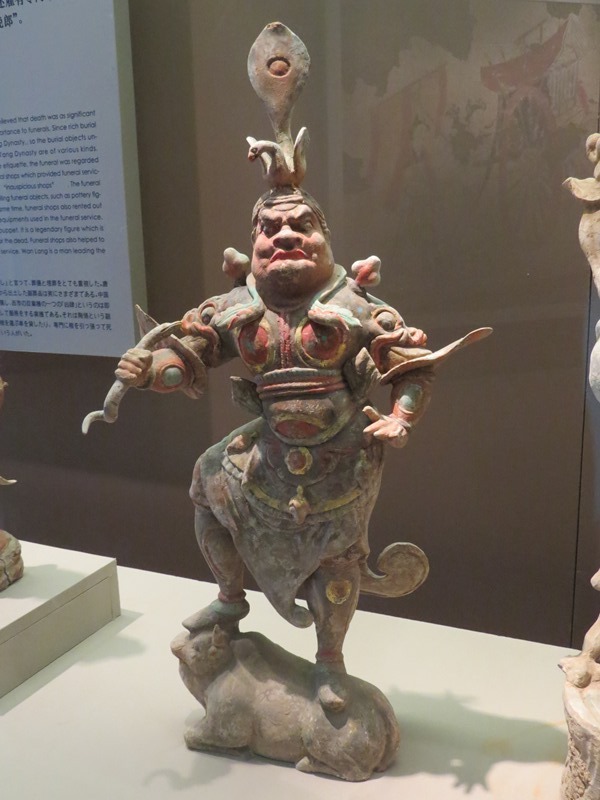 There was an impressive collection of Heavenly Kings, who in the Buddhist faith are known to watch over the four cardinal directions of the world. One of the Heavenly Kings. I think. He was next to the others that were definitely Heavenly Kings, so I think he was, too. 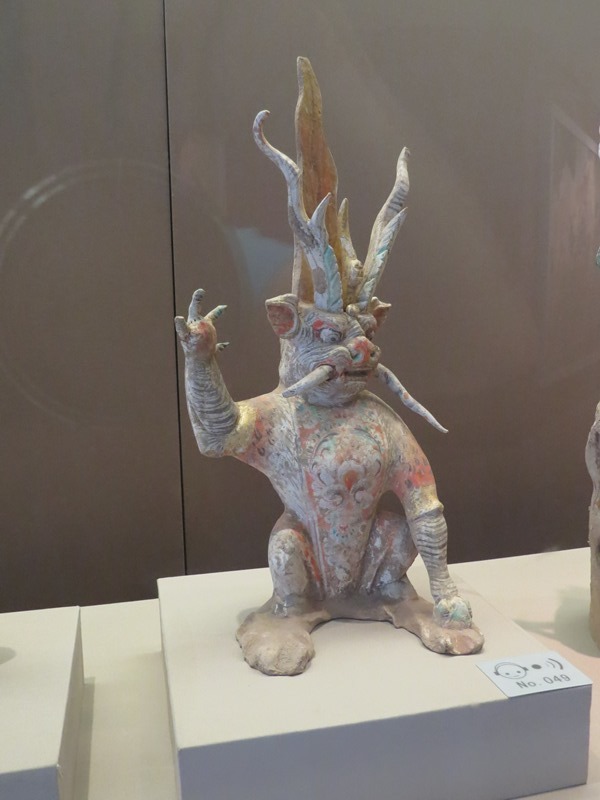 There were also a number of tomb guardian figurines, and their name — and appearance — speaks for itself. A tomb guardian. He will mess you up if you try and sneak in his tomb. One figure that I particularly liked with the tri-color figure of a bird-trainer. Figure of a bird-trainer, excavated from the West Market. Sometimes the coloration could be quite subtle and lovely. 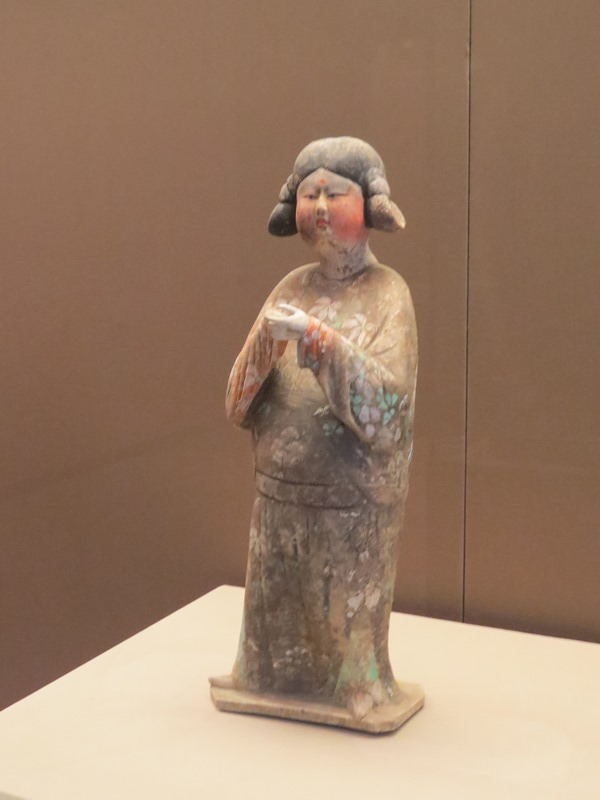 Painted figure of a standing female attendant. Presumably from a more recent time period? 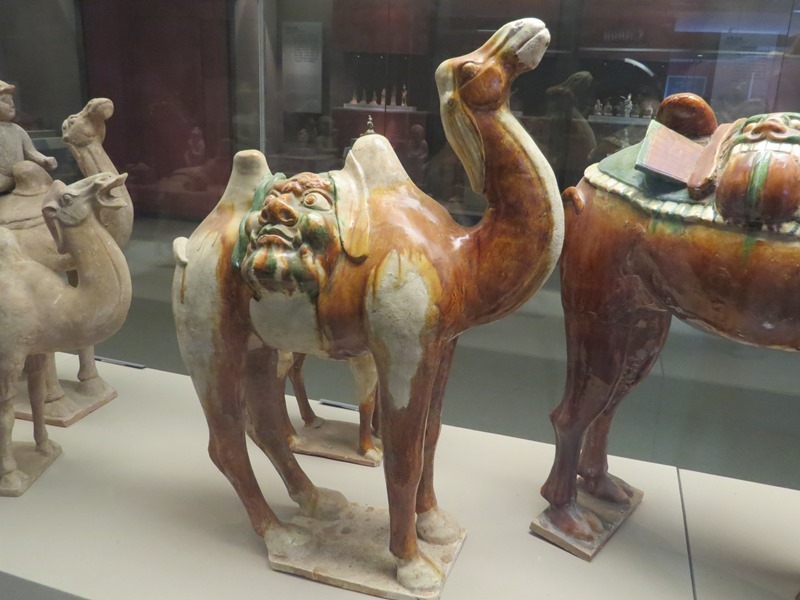 There were many figures of camels featured at the museum. One thing that baffled me: all of the figures had freaky scary faces on their midsections. Why? I don’t know. Tri-color camel with a freaky face on its midsection. 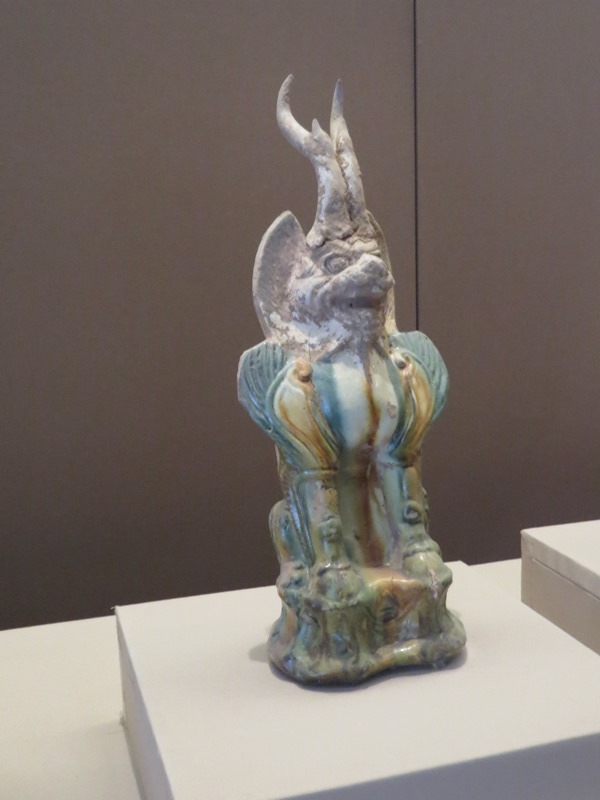 And, now, let me share a pot with a phoenix head. Tri-color pot with a phoenix head. Its body symbolizes the six celestial bodies. The head is the sky, the eyes are the sun, the back is the moon, the wings are the wind, the feet are the earth, and the tail is the planets. Its feathers contain the five fundamental colors: black, white, red, blue and yellow. It is sometimes depicted as having three legs. It is believed that the bird only appears in areas or places that are blessed with utmost peace and prosperity or happiness. 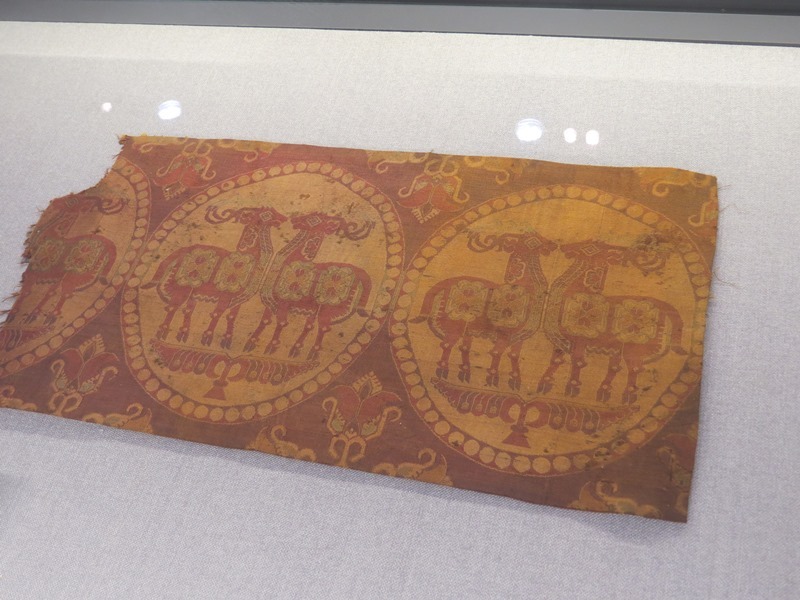 I have many, many more photos, but let me wrap up with a few images of something we’ve all been waiting for: the silk of the Silk Road! 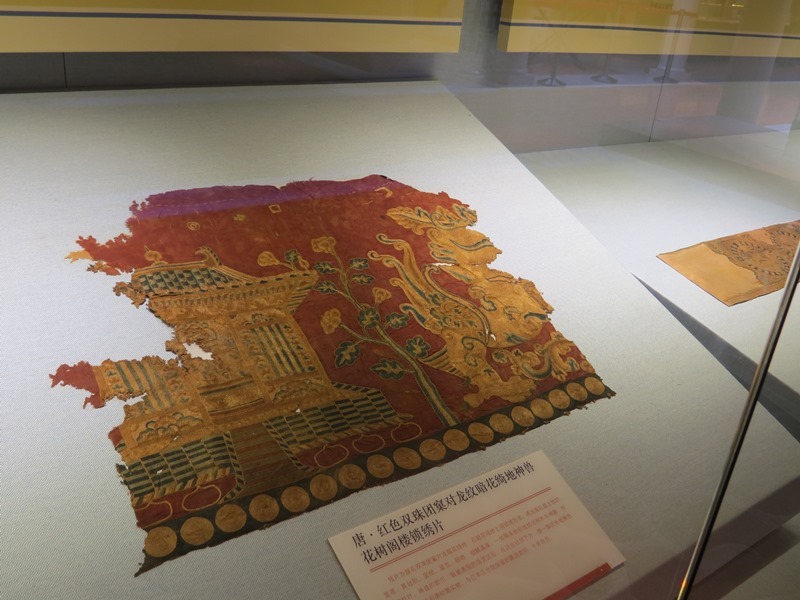 The museum had an exhibit on the top floor with samples of the silk. Nothing was written in English up there, so it was unclear how old the samples on display were, or even if they were original. Nevertheless, there were some impressive patterns. It was not a huge museum, but it was a lovely museum. The fact that it was built on top of the excavation of the original West Market added to its charm and sense of history. This was not the only thing we did that day, either! In my final China post I’ll describe our trip to the old Xi’an city wall. 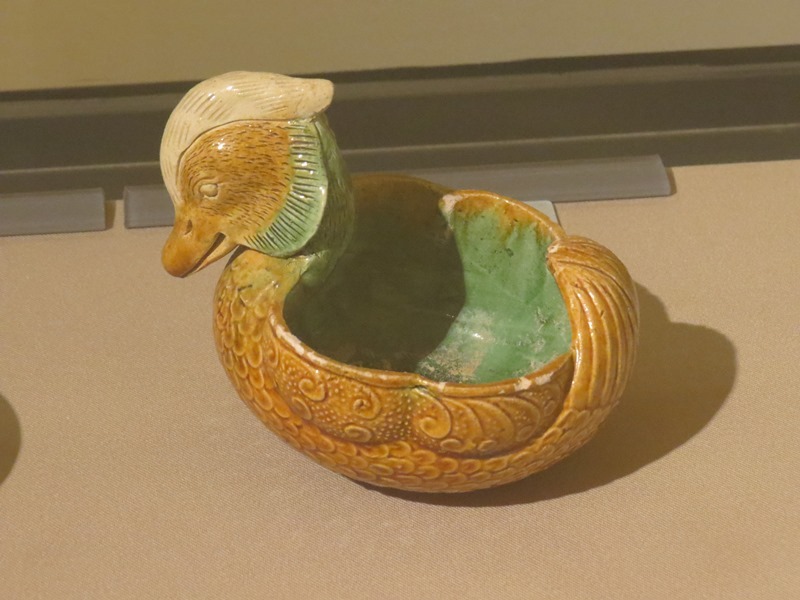 “green glazed pottery ornament.” Hahahahaha…..